> By price > Gifts under 10 euro > Gift Card with Magnetic object "Hippo"
Gift Card with Magnetic object "Hippo"
Magnetic objects are sold individually as gift cards. These cards are both original and practical for sending message and making in the same time a cute little gift. Each magnetic object is placed onto a folded coloured card stock (blank inside) and supplied with a quality envelope. 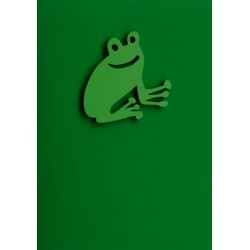 Gift Card with Magnetic object "Frog"